Many years ago, when I first started studying the chakras, I bought a DVD on Chakra Balancing, and found it was simply slides of different colors corresponding to the different chakras. Can color therapy really balance the chakras? Well, I kept testing the theory and did find that often the colors we like best are the colors we most need in our lives and they provide us with subtle vibrational help. The colors in the world around us are manifestations of light and, as such, each possesses a unique frequency… frequencies that do relate to the colors of the chakras. It’s been said that we experience the beneficial affects of color even while blindfolded. We are naturally drawn to those colors that lift our mood, expand our consciousness, and help restore wellbeing. Color therapy allows us to harness the power of individual color frequencies to heal the body, positively influence our emotions, and achieve a renewed sense of harmony. Colors alter the vibrational characteristics of diverse elements of the self so that each resonates at its proper healthy frequency. The colors we like best are often those that we need most in our lives, and there are many ways we can utilize them. Wearing clothes or crystals of a certain color or gazing at an area of color in a painting or nature scene can stimulate or calm us depending on the color we choose. For example, red stimulates the root chakra, grounding us, while yellow strengthens the solar plexus chakra, increasing our energy, and blue acts on the throat chakra, soothing the body and mind and helping us clarify our thoughts. White light, which is an amalgamation of all the colors of the visible spectrum is a cleansing color, one that can purify us on many levels, often associated with the crown chakra. In my Kindle book, Balance the Chakras, Balance Your Life, I have pictures of a clear crystal lighted with different colors. Try meditating on the colored crystals for just a minute, breathing in the color and breathing out any stress or pain, and see which color works best for you at this moment in time. Just like you carry a few everyday items in your purse, pocket or car, like cough drops to soothe your throat, lip gloss to protect and brighten your lips or gym shoes for your lunchtime walk, having a set of crystals can be very useful for clearing energy blockages and opening chakras. Periodically, re-wash your crystals in the salt solution, or in rainwater and then re-energize them by exposing them to moon or sunlight for several hours. Take advantage of the healing energy of every full moon by leaving your crystals outside overnight. Crystals can be simple, yet powerful tools when you’re seeking balance and a sense of well-being in your physical, mental, emotional and spiritual self. To aid in general stress relief, try placing three clear quartz crystals, points facing outward, in a triangle just below your navel. Next, place three rose quartz stones in an arc above your pubic bone and relax for 4-5 minutes. Repeat as often as is needed for optimal energy flow. For a complete Chakra Balance, try this simple crystal layout to reinforce your chakra energies and ensure they are functioning well. Choose a grounding stone (black, brown or dark red) to place between your feet. 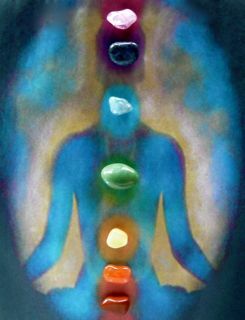 Then choose a stone or crystal corresponding to the different colors of the chakras, placing the red one between your knees, the orange right above your pelvic bone, the yellow right above your navel, the green over your heart center, the light blue on your throat, indigo or dark blue on your forehead and a violet or clear stone on the floor just above the top of your head. Lie down with these stones in place for a period of about 5 minutes or until you feel complete, then remove the stones starting with the one above your head. Relax for a few more minutes, still lying down, then enjoy a sense a well-being and balance, ready to face the stresses of the day ahead. For more information, please go to http://www.TheChakras.org. How do I Use Crystals to Heal and Balance my Chakras? Thanks for the question Laura. When you’re seeking balance and a sense of well-being in your physical, mental, emotional and spiritual self, crystals can be simple, yet powerful tools. Here is a simple Spectrum Chakra Balance you can do daily as a general balancing session, to reinforce your chakra energies and help them to return to normal functioning. Choose a grounding stone (black, brown or dark red) to place between your feet. Then choose a stone or crystal corresponding to the different colors of the chakras, placing the red one between your knees, the orange right above your pelvic bone, the yellow right above your navel, the green over your heart center, the blue on your throat, indigo or dark blue on your forehead and a violet or clear stone on the floor just above the top of your head. Lie down with these stones in place for a period of about 5 minutes or until you feel complete, then remove the stones starting with the one above your head.